I found myself at the airport parking lot one evening, looking for something to chew on. Food choices at the airport are pretty slim, so I took a peek at the coffee shop. I found something that I hadn’t eaten in ages: egg pie. 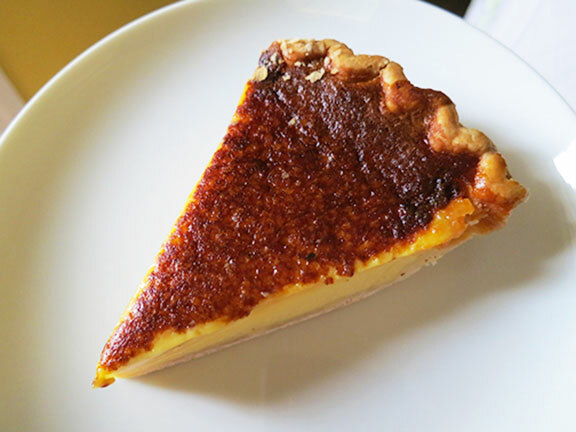 I wasn’t sure if the slice of egg pie was so good because it brought back childhood memories, but this particular one was pretty creamy and I could taste the condensed milk in the egg custard base. I didn’t see the name of the bakery on the wrapper but I figured that it would be so easy to find egg pie should I crave for some more. A week later, I did. I may be blind, but I checked a few local bakeries and it seems like egg pie isn’t as common today. My dad used to bring home egg pie from La Pacita Bakery when we were kids but sadly, they have moved to Antipolo and is no longer as accessible. There’s also a Lord Stow’s near my home but I really wanted the Pinoy style egg pie. I finally came across Baker’s Fair, a place I used to frequent after school for their warm dice mongo hopia. I found the elusive egg pie on the shelves and snatched a couple of slices with some diced mongo. I quickly rushed home with my treats. I carefully unwrapped the pie and diced mongo to share with a cup of tea. Baker’s Fair’s version of egg pie didn’t quite live up to my expectations, the filling tasted more eggy than a creamy custard and the crust had a slight chalky aftertaste. I took a bite of the diced mongo and it had the chalky aftertaste as well. Maybe it was an off day at the bakery? For 20 bucks, it didn’t burn a hole in my pocket, but I’d love to know where I could get a pretty good one in the city. i like egg pie , goldilocks used to have a good one..not anymore. I've tried the happy bakery's egg pie and that was pretty good! Isn't an eggy egg pie a good thing? Haha. Just kidding. Hope you find that good piece of egg pie soon. Good luck! Try the custard pie at Kowloon House, west ave branch only. Hi Jane! Where is happy bakery? Try Long Life bakery, retiro corner mayon st, qc. My favorite is Merced's egg pie. Really yummy! thanks for the suggestions, grumpyurbanslacker and marie!